Vortex Strike Eagle 1-6x24 AR-BDC Reticle Scope SE-1624-1 with its 1x variable optics is high on speed and versatility - attributes that are crucial for AR shooters who have to bring down targets from point-blank out to extended range. It's true one-power on the low end facilitates quick target acquisition in close quarters scenarios and the higher end of 6x zoom range helps in engaging targets at distance. The scope is suitable for 3-Gun Stage, practising at the range, targeting a coyote, aiming in low light conditions and more, at an economical price. Highlights include fully multi coated lenses, 6x zoom range, 3.5 inches eye relief adjustment, Capped turret style, second focal plane reticle configuration, fast focus eyepiece, neutral pressure nitrogen purging, o-ring, and a 30mm single piece aircraft grade aluminum tube with hard anodized finish. Vortex SE-1624-1 is available with glass-etched, illuminated AR BDC reticle that subtends with popular 5.56 mm cartridges. 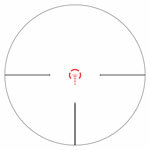 The reticles center target dot with surrounding halo encourages rapid target acquisition.